Here are the Best of the Web Archives! Imagine a young mother and happy homemaker in a small Texas town thrust into World War II! Only in her late 30s, she must face a life she had never planned for. Imagine signing a release to let your oldest son just 17 join the Army Air Force. Imaging facing the draft for your youngest son. She tells you how a patriotic mother feels about women in combat. 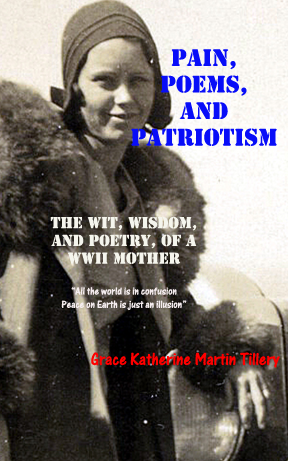 In poetry she writes about her youngest son and to her oldest in Germany in 1945. Even a sad lament from an unborn baby who's chosen father to-be "My father is dying, dying I say on a cold and cruel battleground." This is an amazing insight into life in WWII. As editor often get outstanding contributions from readers. They represent hard work of others who share my passion to remember! I can't put on KilroyWasHere.org as mine but they deserve wider distribution. 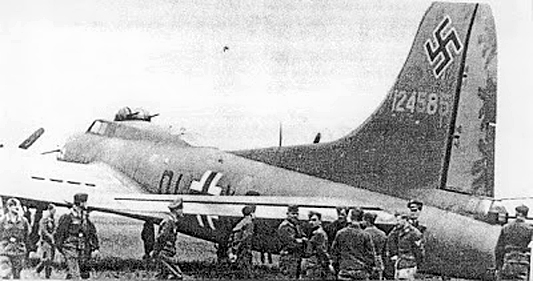 "During World War II, after crash-landing or being forced down, approximately 40 B-17s were repaired and put back into the air by the Luftwaffe. These captured aircraft were codenamed Dornier Do 200, given German markings and used for clandestine spy and reconnaissance missions by the Luftwaffe - most often used by the Luftwaffe unit known as KG 200, hence a likely possibility as a source for the Do 200 codename." At last I can post a tribute to Bill Mauldin! What a great cartoonist and he was there with his Willy and Joe! I received via email with images embedded. If you know the author, please let me know. "He meant so much to the millions of Americans who fought in World War II, and to those who had waited for them to come home. 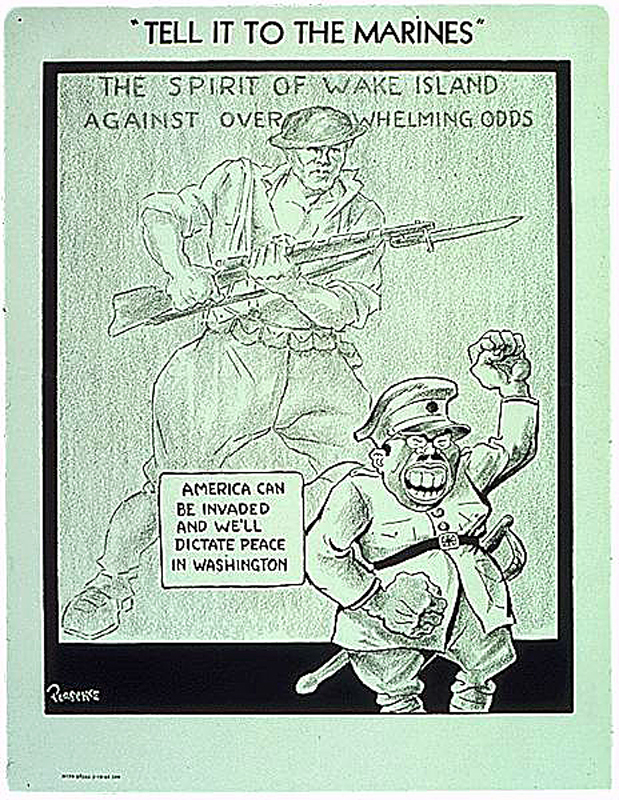 He was the kid cartoonist for Stars and Stripes, the military newspaper. 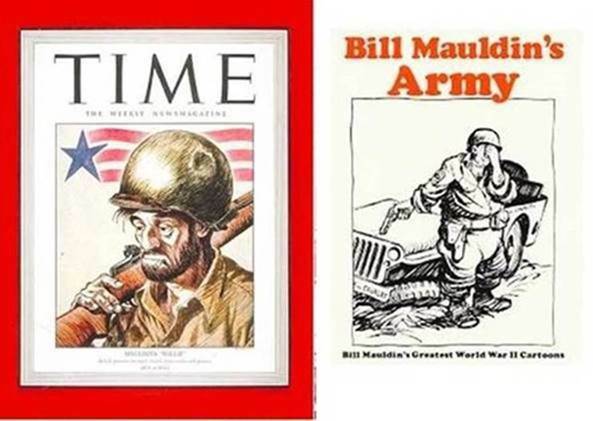 Mauldin's drawings of his muddy, exhausted, whisker-stubble infantrymen Willie and Joe were the voice of truth about what it was like on the front lines." P-51 Mustang "Bad Angel" in Hanger #4 at Pima Air and Space Museum. For those who don't know (I was one) the Pima Air & Space Museum, located in Tucson, Arizona, is one of the world's largest non-government funded aerospace museums. 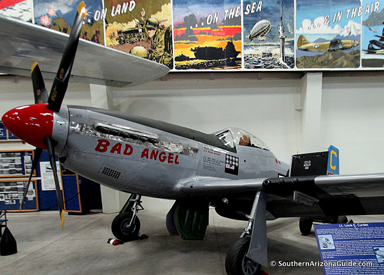 The museum features a display of nearly 300 aircraft spread out over 80 acres on a campus occupying 127 acres.) On the Saturday following Thanksgiving 2013, Ms. Karen, my 94-year-old father, Bill Gressinger, and I were visiting Pima Air and Space Museum. We were in Hanger #4 to view the beautifully restored B-29, when I happened to take notice of a P-51 Mustang near the big bomber. It's name? "Bad Angel". 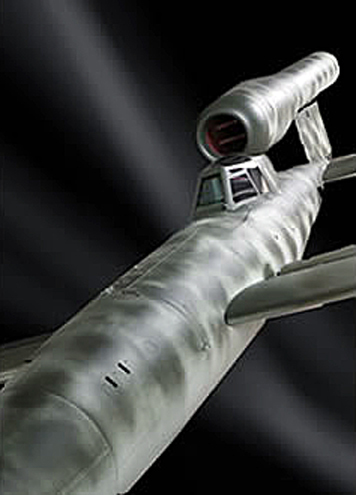 "Late in the war, several piloted V-1s were built. The plan was that a pilot would guide the missile into position close to its target and bail out at the last moment. It was essentially a suicide mission, as it would have been very difficult to open the canopy against the wind resistance and in the unlikely event that the pilot was able to climb out he would have undoubtedly have been sucked into the intake of the engine. This manned missile killed several pilots during landing in flight tests. All of the Reichenbergs were air-launched from planes, unlike the unmanned V-1s that were mostly fired from ground-based catapult ramps. The war ended before Germany could use the Reichenberg in combat." 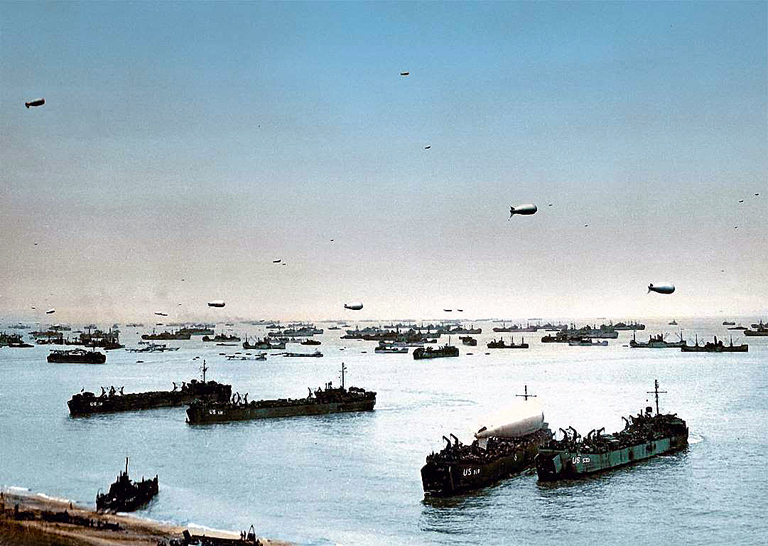 "June 6, 2016, marks the 72nd anniversary of the D-Day invasion, also called Operation Overlord, which saw 156,000 Allied troops from The United States, the United Kingdom, Canada, Free France and Norway land in Normandy to begin the liberation of France and turn the tide of the war against the Nazis. (Pictured) Lieut. Commander D.W. Pifers, D.S.C., R.C.N., of Halifax, commanding Officer of H.M.C.S. "Algonquin," one of Canadas newest most powerful destroyers, briefs his ships company, while on route to the invasion beachhead in 1944." 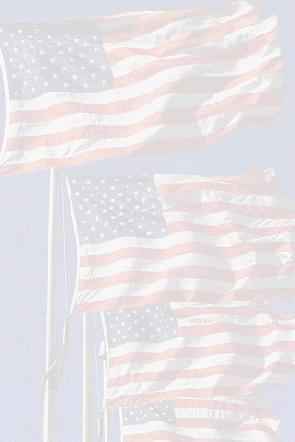 BOISE, ID- The United States Marine Corps will honor Veterans of the Battle of Wake Island along with their families December 7, 2016 at 10am at Veterans Memorial Park. The park is located at 930 North Veterans Memorial Parkway in Boise. The United States Marine Corps will honor Veterans with a presentation of colors, wreath laying and TAPS at the memorial in conjunction with Boy Scout Troop #123 who was responsible for the creation of the memorial in 2011. Then Boy Scout Noah Barnes, working on his Eagle Scout project, spearheaded this initiative in memory of his great grandfather who was a POW at Wake Island. The Battle of Wake Island began almost immediately after Pearl Harbor was attacked by the Japanese. Marines and contractors from the Morrison-Knudsen company were able to hold the island for two weeks before surrendering. Many Americans not only lost their lives in defense of the island, but also became prisoners of war. This memorial is the only memorial in the continental United States that commemorates the Battle of Wake Island. For more detailed information about this event, please contact SSgt Stewart with the Office of Marine Corps Communications, Community Relations section at 804-240-9813. 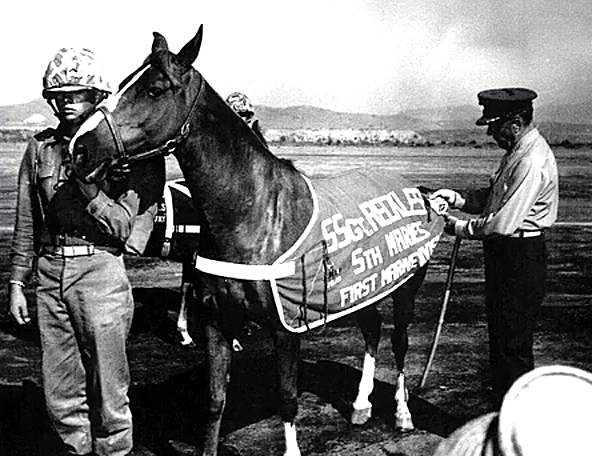 Reckless was a pack horse during the Korean war, and she carried recoil-less rifles, ammunition and supplies to Marines. Nothing too unusual about that, lots of animals got pressed into doing pack chores in many wars. What a moving follow up to Veterans Day. When about to update the site I was sadly removing the tribute to Veterans when I received this from and old, good friend. It relieved the sadness of removing the Veterans Day tribute. For those who sail beneath the surface of the sea, there are few greater fears than permanently descending to the depths alive. The movies would play this horror scene out time and time again as you watched the sailors press their faces to the ceiling of a room slowly filling with water. But for one such man, that was the fate he chose for himself when he voluntarily locked himself inside a sinking submarine descending to the bottom. 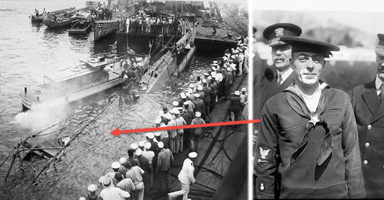 For his actions that day, Henry Breault would become the first and only Submariner to ever receive the Medal of Honor.